The Scottish government has backed down over its opposition to Edinburgh's trams project, after suffering its first major Holyrood defeat. It will now be taken forward, but Finance Secretary John Swinney said plans for an airport rail link in the capital had "had it". Opposition MSPs voted down a motion to endorse the minority government's transport priorities. But the government warned it would not always bow to the will of parliament. Earlier, Transport Minister Stewart Stevenson announced plans for a new Forth crossing, but also raised concern about the state of several other major transport projects in Scotland during a statement to Holyrood. MSPs backed a parliamentary amendment by Labour's Wendy Alexander to go ahead with trams, but within the budget set by the previous Scottish Executive. It also asked the government to attempt to resolve problems identified with the rail link, known as Earl, by Scotland's spending watchdog, Auditor General Robert Black. Mr Swinney told BBC Scotland: "We didn't want the trams project but parliament has voted for it and the opposition has put a financial constraint on it and I will vigorously apply that financial constraint." But on Earl, he said: "Parliament has asked me to see if this project can be salvaged. I don't think it can be, but I'll come back to parliament in the autumn with my view." Mr Swinney added: "I think Earl has had it". Ms Alexander, Labour's finance spokeswoman, said Mr Stevenson's statement was a cover for killing the airport link and the trams. "Let no-one be in any doubt that Earl and trams are being killed because the executive can not make their sums add up," she said, claiming the future of Scotland's capital was at stake. 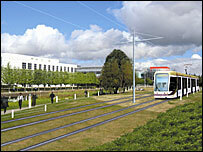 "From an executive which has spent money like confetti over recent weeks, it really does not wash."
Conservative finance spokesman Derek Brownlee said parliaments' view would send a signal to both Edinburgh City Council and Transport Initiatives Edinburgh, the company formed to deliver trams and other transport projects for the council, that costs would have to be controlled. "If they cannot finance the construction of the project within the budget they are being allocated, then they will bear the responsibility for the public money which has already been spent," he said. Former transport minister Tavish Scott said the SNP had "dug a hole of their own making". The Liberal Democrat finance spokesman accused the government of commissioning the auditor to try and justify their claim that costs were spiralling out of control. "Bob Black didn't play ball - the auditor general concluded there was no evidence that costs were out of control," said Mr Scott. "All three ministers - [Alex] Salmond, Mr Swinney and Mr Stevenson - said the costs were out of control. They are not." Green MSP Patrick Harvie claimed that public support for trams was overwhelming, but added: "Many of us feel that Earl as a project is so fatally flawed that it will kill itself off without the need for a motion here to do it."